In a bowl, combine the cheese, minced basil, dried basil, salt and pepper. Using a fork mix the ingredients well until incorporated. Cut the top off each cherry tomato and then use a small spoon to remove the pulp and hollow out the shell of the cherry tomato. Discard any juice that accumulates in the shell. Fill each tomato with the cheese mixture. 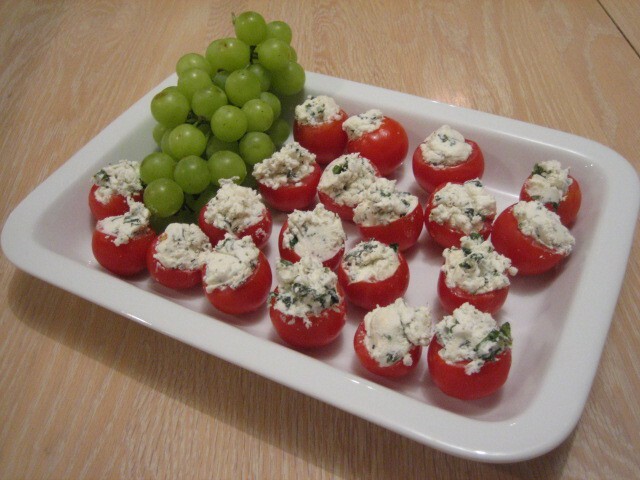 Arrange the stuffed tomatoes on a serving platter garnish and refrigerate until serving.